Preheat oven to 350°F. Line a baking sheet or jelly roll pan with tin foil. Using kitchen scissors cut your bacon into thirds. There’s no need to cut each individual piece; cut the whole slab at one time. Wrap 1/3 of each bacon slice around a smokie and secure it with a toothpick. After you have wrapped all of the smokies, place them on the baking sheet and sprinkle brown sugar on top of each smokie. Bake sausages for 40-45 minutes or until the bacon is crispy and the brown sugar has melted. Serve immediately or keep warm in a crockpot. Makes around 48 smokies. 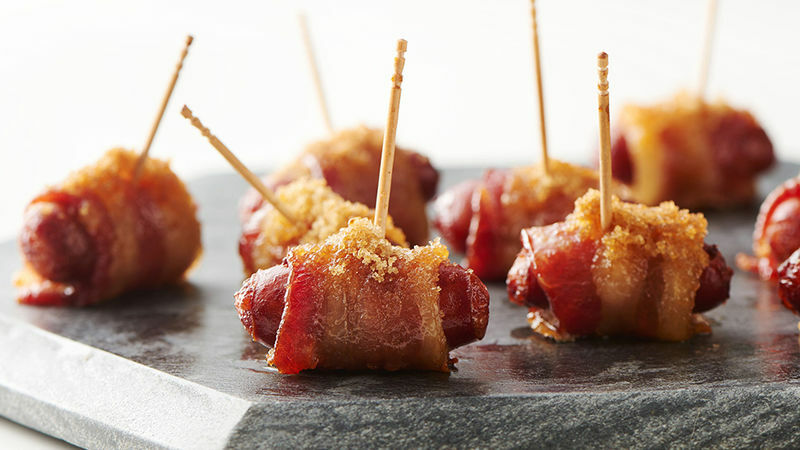 The classy cousin to pigs in a blanket, people have been making bacon wrapped smokies the exact same way forever. Why fool with perfection? You couldn’t ask for a more irresistible combo than sweet brown sugar and salty melt-in-your-mouth bacon. Rest assured, we have other addictive apps where this came from.